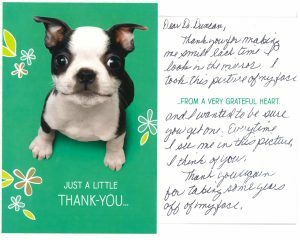 We love hearing from our patients. Please visit our review sites to read real patient reviews for Dr. Diane Duncan. An amazing lady with incredible, life-changing results! Thank you for your kind words and for dropping off this lovely card! 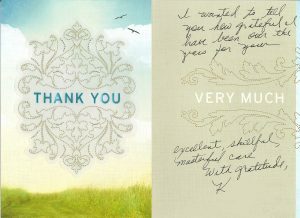 A very special thank you to a patient from 20 years ago for stopping in and dropping off this hand-written Thank You card! “Working with PSA was easy, informative, supportive, professional; with appropriate expectations set at the beginning of the process; delivering wonderful results. Based on Dr. Duncan’s recommendation I selected the procedure: J Plasma to the abdomen and 1 flank. The result from my & my husband’s observation is ‘significant’ and good. I am a mid 50’s female, a lifelong work-out person. No matter what I did I couldn’t lose the donut in my midsection. Dr. Duncan performed a symmetrical, thorough, artistic, and accurate procedure; which matched her prediction given during our pre-procedure appointment. 4 months post-procedure, as inflammation continues to improve, the j-plasma technology seems to hold true to the studies, including skin adherence & shrinkage. “Most of my life I was happy with my C-cup breast size. But after having 4 children and turning 41, my breasts were small and sagging and barely an A-cup! I made a consultation appointment with Dr. Duncan because of her 20+ years of experience and at my initial consultation, I immediately felt comfortable. Dr. Duncan listened to me and took the time to answer all of my questions. I consulted with 2 other plastic surgeons who both recommended an implant size larger than Dr. Duncan. I would have been very unhappy with breasts larger than I have now!! I definitely made the right choice in selecting Dr. Duncan for my breast augmentation. Dr. Duncan understood that I didn’t want large, trashy, fake-looking breasts. I just wanted my old breasts back! And I am thrilled with the results. After only 3 months my scars are barely visible. My breasts look AND feel completely natural. They are perfect and exactly what I wanted! I have already referred 2 close friends to Dr. Duncan! I elected to have a ‘tummy tuck’ procedure at the same time and I am equally thrilled with the results. I am a runner and I work out 5 days a week. No amount of exercise seemed to help my lower abdominal area. Another plastic surgeon I met with insisted that I did not have enough skin to keep the surgery scar below my underwear line. Dr. Duncan assured me that my scar would be low and she was right! My tummy is now flat and taut and the scar is not visible in my 2-piece swimsuit! “When I visit a doctor for the first time, the initial interaction between the employees and me sets the tone for either a comfortable or an uncomfortable relationship. Dr. Duncan’s staff immediately initiates a caring and sincere concern for each patient. One feels welcomed! “In college, I had a lumpectomy from one of breasts and they have been asymmetrical ever since. For 17 years I lived with uneven breasts. I was always self-conscious of the way they looked and tried everything from silicone bra inserts to wearing two or three bras to flatten them so the size difference wasn’t noticeable. I finally decided I had enough. I found Plastic Surgical Associates online, and when I met Dr. Duncan and her staff I felt right at home. Not only were they friendly, they answered all of my questions and listened to my concerns. I was extremely nervous and they helped me feel at ease. After meeting Dr. Duncan, I knew she was the physician I wanted to perform my surgery. Goodbye bra inserts! I was in tears the first time I saw my breasts after surgery. Dr. Duncan did an amazing job! They look fabulous, plus they were nice and perky. After my surgery, Dr. Duncan and her staff were diligent about following up with me to see how my recovery was coming along and to answer any questions. Anyone considering any type of cosmetic procedure needs to schedule a consultation with Dr. Diane Duncan immediately. You will never regret it!!! You will receive excellent care from a highly educated, experienced, caring physician and her friendly, knowledgeable and professional staff. Dr. Duncan and her staff are not about “selling” you procedures and anti-aging products that do not work. They are very straight forward about what is possible and how to achieve natural looking results. Prior to meeting Dr. Duncan, I had undergone several procedures and tried numerous products that were very disappointing and a waste of time and money. Dr. Duncan delivers what she promises! Now when I walk past a mirror, I feel great instead of wondering who that old woman is. I highly recommend Plastic Surgical Associates and will have all future procedures with Dr. Duncan. After my recent birthday and after a year of seeing a tired complexion, I started doing some research into laser resurfacing. I had no interest in traditional nip-and-tuck plastic surgery, and I had heard nice things about the results that Dr. Duncan’s patients have achieved. During the consultation, Dr. Duncan proposed some very affordable options based on my objectives: perk up my complexion and get rid on the fine lines on my upper lip. With the deep laser resurfacing and Restylane Injections, the objectives were exceeded! The fine lines were eradicated and my complexion feels so firm now. Additional benefits were the corners of my mouth being turned up a bit, a better-defined jawline, and my left eyelid being lifted with a light pass of the laser. It matches the other eyelid appearance now. It is some of the best money I’ve spent on services from Dr. Duncan and her great staff. I had been dreaming of getting a tummy tuck for the last decade but didn’t start looking for a plastic surgeon until I had enough money saved. The day finally arrived so I got online and searched for surgeons in the Northern Colorado area, as there were so many to choose from. I felt the best place to start was the before and after galleries and one doctor really stood out to me, Dr. Diane Duncan. Her worked looked so natural in comparison to the others and I also noticed information on a procedure called the almost scar-less breast lift. This was another area I had considered getting worked on but was not enthused about cutting around the areola and risk losing sensation with a periareolar lift and I wasn’t about to have the Franken-scars from an anchor lift, so this new procedure intrigued me. My initial consultation with Robbin was on a Friday, I met with Dr. Duncan the following Monday and had my surgery that Wednesday. I am absolutely thrilled with the results of both the breast lift and the tummy tuck. AMAZING is the best word to describe her work and how I feel! I was always small breasted but didn’t realize the effect nursing two children would have! My breasts went from small to almost non-existent. This definitely took a toll on my confidence over the years. I had a couple friends that had breast augmentation surgery and raved about the positive effect it had on their lives. After much thought, I made the decision to have the procedure myself. I went to a few doctors for consultations and finally came across Dr. Duncan. The staff was so friendly and I knew as soon as I spoke with Dr. Duncan there was a connection between her philosophy and my expectations. 6 weeks after my breast augmentation I feel amazing! Looking back it seems like such an easy procedure for the lifetime of confidence I know I’ll have. I truly feel that this was the way I was supposed to always look. I can’t say “thank you” enough. I have had the most amazing experience here! I knew at my consult that Dr. Duncan was my surgeon, she knew exactly what I was wanting! I ended up with the results I had imagined. The staff was so friendly and informative as well. I will be referring all of my friends! Thank you so much!